Official portraitist for the royal courts of Europe, Franz-Xavier Winterhalter was the favourite painter of the Empress Eugenie. Indeed, Eugenie most probably used her own personal fortune to pay for this renowned collective portrait representing the sovereign in 1855 surrounded by her ladies in waiting. Hung in Fontainebleau Palace during the Second Empire, the work was finally given to the empress in 1881, when it was hung in the entrance to her residence in Farnborough Hill. Taking its inspiration from 18th-century bucolic scenes, this monumental composition sets the sovereign and her entourage against the backdrop of a shady clearing in a forest, (evoquing certain 17th-Century compositions representing Diana and her companions such as those by Rubens or Van Loo). However, the composition is very artifical and formal. The Empress, slightly to the left of centre, is encircled by and dominates the group. To her right sits the Princesse d’Essling, chief lady in waiting, to whom she is offering some honeysuckle. To her left, is the Duchesse de Bassano, matron of honour. Before her sit the Baronne de Pierres and the Vicomtesse de Lezay-Marnésia, both ladies in waiting. In the foreground is Comtesse de Montebello; to the right are three other ladies in waiting, the Baronne de Malaret, the Marquise de Las Marismas and the Marquise de la Tour-Maubourg. In striking contrast to the rustic setting, the ladies in waiting rival each other in vestimentary luxury. Each one is wearing her finest ball gown, thus giving the painter a pretext for a virtuoso display of material painting, even to the detriment of the likenesses. In fact the real subject of this glorification of the crinoline is the silk, tulle, muslin, taffeta, lace and ribbons. Only the simplicity of the jewelry seems to match the pastoral setting. 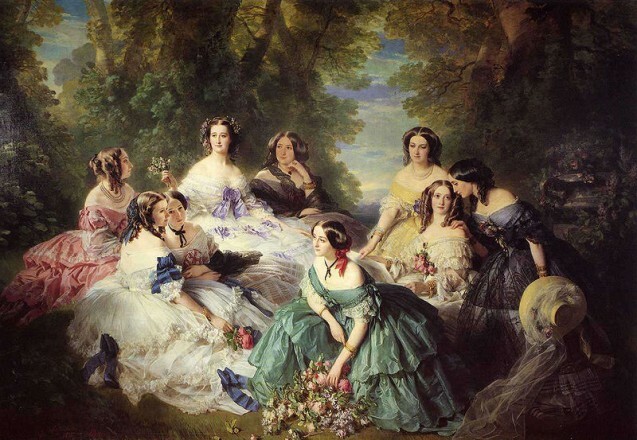 Eugenie herself is the only one in the painting wearing no visible jewelry: Winterhalter has even revised his initial composition to hide (behind the head of one of her ladies in waiting) a bracelet that the Empress might have been wearing. In doing so, he not only managed to highlight the pefect alabaster-white bust of the young sovereign, but also reveal her modesty illustrated shortly before, in 1853, during Eugenie’s marriage to Napoleon III. Eugenie had declined the gift of a diamond necklace from the municipal committee of the capital, and had instead requested that the value of the jewellery be spent on the creation of a school for children. By this tactic Winterhalter has shown not only the physical qualities of the Empress but also her moral ones. Thus positioning her higher up than her ladies was not simply by protocol but also a sign of the elevation of her soul. This overseeing figure is not intended to be overbearing however: the honeysuckle strand that Eugenie offers to the Princess of Essling embodies, in the floral tradition of the nineteenth century, the symbol of true friendship. Another flower whose presence subtly enhances the hair and dress of the empress is the lilac. This plant which was particularly appreciated by Eugenie, as shown in a previous portrait by Winterhalter, symbolizes in the nineteenth century* the season of Springtime and the amorous sentiments that often accompany it. Eugenie is thus adorned with simplicity, virtue and fidelity in friendship. The lilac basket on the right of the stage is yet another reminder of this highly symbolic plant. In the 1850s, the forced production of lilac, in glasshouses was booming: indeed the town of Vitry-sur-Seine (in the region around Paris) made a speciality of it. Producers were able to program the plant’s growth so precisely that they were able to supply the flower from October to March for pre-ordered dates. Eugenie, who was the model of Parisian fashion, was undoubtedly instrumental in the popularity that this flower inspired at the time by often displaying it on her ceremonial outfits. The work is particularly revealing with respect to the extreme refinement typical of the court. Indeed this same pomp was displayed at the opening of the Paris Exposition universelle of 1855, the first major official manifestation of the imperial regime and an important stage in terms of international recognition of the regime. This painting was exhibited on that occasion in the Salon d’honneur, and (despite the official censor) was discreetly pilloried by the art press. Théophile Gautier spoke of the “coquettish and brilliant style […] a little too obsessed with elegance” and Gustave Planche severely criticised this “parody of Watteau” where the “dresses were excessively coquettishly spread out but contained nothing whatsoever”. Despite critical scorn, the painting was and still is a huge public success. * We think here of the poem of Ernest L’Épine, written around that time : “Voici le Printemps qui avance/Le front couronné de lilas/devant lui sourit l’espérance/du bonheur il guide les pas” [“Behold Spring advances / her forehead crowned with lilac / before her smiles Hope / leading the footsteps of happiness”].